2017 has not been the easiest year. We’ve seen bans specifically targeting Muslims, America officially inaugurating a sexist as the president, and xenophobes everywhere bolstering discrimination. But don’t let that fool anyone – the #MuslimGirlArmy doesn’t let even the most heated hate get in the way of Muslim women’s history. This Monday, March 27, we celebrated our first ever #MuslimWomensDay. An idea, crafted by Amani Al-Khatahtbeh and bolstered by our team and collectively supported by a slew of powerful allies mentioned below, in fact swept the Internet by storm. Together, we were able to conquer it all, from widely circulated Facebook Live videos with magazines to the #1 trending hashtag on Twitter. The campaign raised the bar to a whole new level of nuanced mainstream representation for Muslim women. As we gear up to tackle each day of every year that lies ahead, we look to a successful, beautiful, empowering #MuslimWomensDay as the example of how Muslim women’s voices should be considered and heard every single day: from ourselves and for ourselves. Here’s a look back at some of the top features with whom we are so thrilled to have collaborated on our historic holiday. 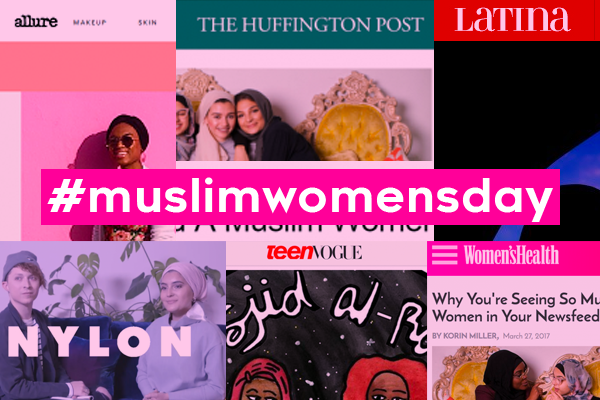 Check out some highlights from the incredible content that our allies created to flood the Internet in honor of #MuslimWomensDay. Check out 11 Muslim Fashion-Beauty Icons discussing style, entrepreneurship, and personal stories. Allure also bumped to their Facebook page a Lifestyle article from this fall, which discussed fashion and makeup for Muslim women, particularly highlighting recent headlines in the context of some Middle Eastern societies. Scroll through an awesome listicle of 11 times women in hijab took center and rocked the world. Bustle rounds up a ton of articles and videos about what MWD is all about. Some of our favorite make-up gurus – Noor, Safy Hallan Farah, and Maryam Said – share the Somali skin secrets we’re all eager to know. Amani rocks it in a Q&A interview with Complex discussing how we can keep our momentum of Muslim women in the media growing. Amani chats with Russell Simmons, the chairman of the Foundation for Ethnic Understanding, about solidarity and voices in today’s political and social climate. 11 of our favorite beauty bloggers strike again. Why we need Muslim Women’s Day, Twitter responses, and photos of Muslim women around the world: HuffPo’s got us covered. Our girl Azmia celebrates her power as both a Muslim woman and a Latinx woman. Nadia Manzoor and Radhika Var keep it real on their experiences embracing feminism and reconciling nuance, both especially within the contexts of their Muslim womanhood. Shyema Azam runs us through a week’s worth of her glam get ups. Catch Fatima, a young Muslim athlete, radiating confidence throughout this video with MTV. Mydomaine has our back with how everyone can be sharing Muslim women’s voices everyday of the year. Our social media editor Safaa Khan kills it in this Facebook Live with NYLON about #MuslimWomensDay. Find your favorite writer in the mix, as Obsessee showcases this video full of inspiring members of the #MuslimGirlArmy. Zarina Iman kills it in this essay about what Muslim Women’s Day means to millennial Muslim women. Teen Vogue raises awareness about an LGBTQ-inclusive new mosque opening in Chicago. The non-profit behind Michelle Obama’s inaugural USOW summit spotlights amazing Muslim women and why they celebrate Muslim Women’s Day. Women’s Health made sure to raise awareness of the importance of the day to their readers, using a photo from our Getty Images partnership! We have SO MUCH gratitude to all of our allies who made the first Muslim Women’s Day happen this year, and we can’t wait to continue elevating our narratives together all year long.